Chickenfoot is a fascinating dominoes game for all ages. It features special dominoes with brightly colored pips, a "hub", and abundant fun for families, parties, and other get-togethers. The object of the game is to play all your tiles and have the lowest score at the end of the game. At the start of the game, each player draws tiles from the "chicken yard", one tile at a time. The first player to hold the double-nine tile goes first, positioning the tile in the center of the hub, then play proceeds clockwise. The remaining tiles that contain double nines are then played into the other notches on the hub, forming a double "chicken foot". Thereafter, tiles may be placed on any of the six "chickentoes", and so on. Chickenfoot can also be played with double twelve dominoes. Complete rules are available from Domino-Games.com. Windows version of the classic domino game Chickenfoot. Play against 2-7 computer opponents, with planned multiplayer/internet expansion. Game appearance and game options are completely configurable. Fox Creek Store is the home of the original "Chickenfoot" game. 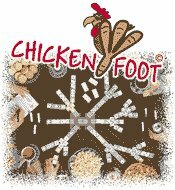 The site includes chickenfoot sets for sale, rules, and a brief history of the game. Note: The Chickenfoot image at the top of the page is provided courtesy of Puremco, home of one of the world's largest collection of domino games.